John Gaudio, the keeper of the flame as far as EntConnect goes, had written a blog entry about its history. Today I thought I would include an image from a ‘sampler’ magazine that Bill Gates used to send out to stir up interest in Midnight Engineering. Click on the image above for a readable version of it. 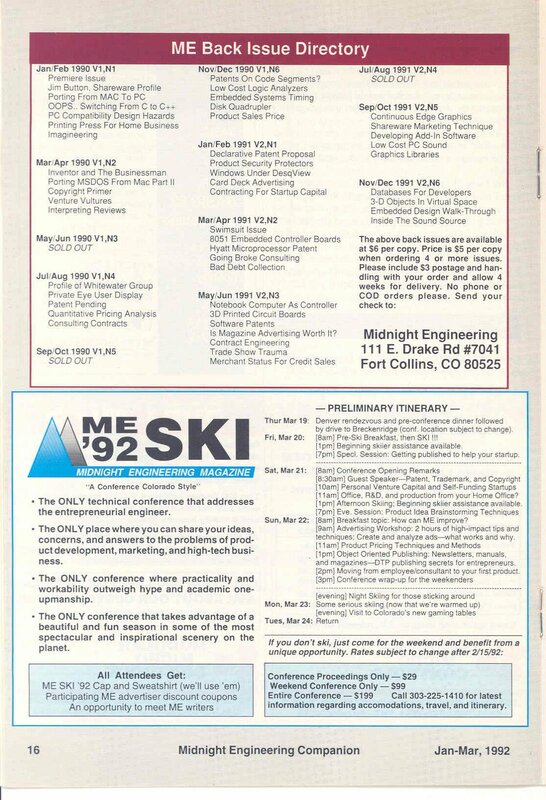 You can get an idea of the agenda of the very first 1992 ME-Ski conference and above that, there’s an advertisement for some ME back issues, including some of the topics covered in those issues. 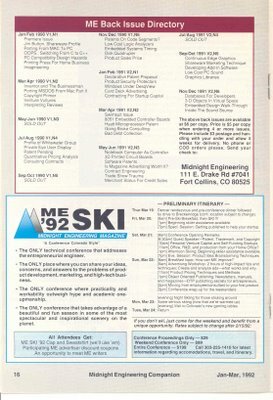 I still have many of my Midnight Engineering back issues since I felt there was something unique and irreplaceable about them and couldn’t bear to throw them out. I’m sure they are destined to become collectibles. I often wonder if Midnight Engineering magazine will ever be relaunched or if a similar magazine (or possibly a website) may appear. Catering to high tech entrepreneurs and bootstrappers is a niche, but probably even more relevant today than ever as few engineers have the option of working for a large and secure employer from their first job until they are ready to retire. We are all self-employed in many respects and developing one’s entrepreneurial instincts is as essential for an engineer as it is for a CEO running her own show.